Greetings everyone, and Happy New Year! I’ve done more than 1700 engagements (keynotes, talks, seminars, workshops and advisory sessions) in over 50 countries. My YouTube channel is now nearing 20K subscribers, with the total watch-time of my 556 videos exceeding 15 Million minutes. My total audience has grown to an estimated 2.5 million people, globally. So first, a huge THANK YOU to all my clients, all the speaking bureaus that have booked me, and all the amazing people I was so fortunate to meet and speak with, on-the-road: you have taught me so much! 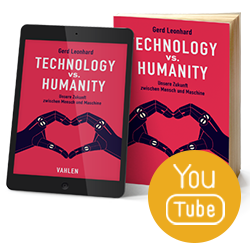 I have been very fortunate that my 2016 book ‘Technology vs. Humanity’ has been successful beyond my wildest dreams – it’s now available in 10+ languages and many memes from the book (such as #DigitalEthics and of #techvshuman) have now been widely adopted across the Internet. Almost 75% of all my recent talks have already been on this topic! Now, it’s time to talk about what really matters: the future of humanity. It’s time to go beyond the focus on more-or-less business issues such as digital transformation and ‘the Megashifts’ to the topics that are truly existential and crucial for the future of humanity. It’s also time to acknowledge my strongest passions. During the past 2-3 years I have come to realise that I feel most passionate about human and societal issues that often encompass technological future scenarios. I also have discovered that I have a some-what unique ability to fuse content and ideas from science and technology, business and economics as well as from philosophy, culture, society and humanity in my talks. Going forward, I will focus on these 6 speaking topics below. 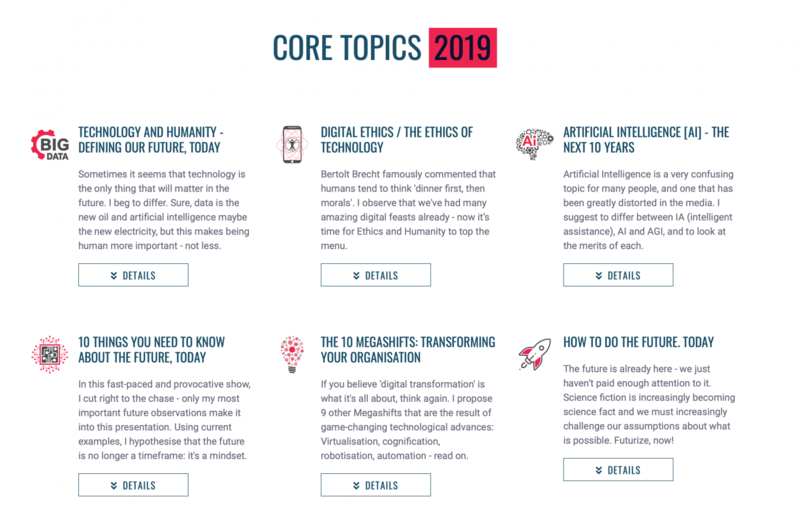 Download the PDF with my speaking topics: 2019-Gerd-Leonhard-Futurist-Core-Topic I will still consider other engagements (such as on my legacy topics); however all engagement requests on my 2019 core topics will receive priority. Many of my traditional business topics can also be covered by my esteemed and accomplished colleagues at The Futures Agency.